Attendants at our hair transplant training courses will learn to perform the latest state-of-the-art method FUE (Follicular Unit Extraction) as well as BHT (Body Hair Transplant) with a varying number of surgical tools. 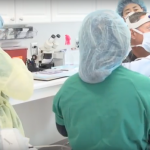 A comprehensive training program can be scheduled by physicians and medical assistants willingly to be trained in different extraction techniques and restoration methods. 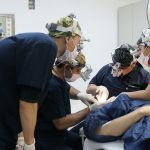 The Hair Transplant Training Center in Ankara is regularly providing a number of leading experts for hair transplant to visiting doctors, aspiring physicians and medical assistants who will successfully graduate with a practical knowledge of minimally-invasive techniques and instruments. Everyone is invited to explore an emerging area of practice and learn how to effectively handle modern medical instruments and surgical tools during a hair transplant procedure. Participants are allowed to a complete observation of the highly equipped clinic in Ankara / Turkey. Understanding the efficient utilization of contemporary devices forms the fundamental basis for final success and excellent results. The Hair Transplant Training Center offers practical attendance to visiting doctors and medical practitioners. This includes comprehensive involvement in all practical treatment on actual patients. Every participant of the fue workshop or hair restoration training is encouraged to make complete utilization of every medical tool and instrument provided by the clinic. Patient availability will be ensured for every training program by the Hairline Clinic in Ankara and Hairforlife. All of the patients are voluntarily opting for a hair transplant. Patients will be informed about the circumstances earlier. Any liability of the trainees will be excluded by the Hair Transplant Training Center. HTTC offers hair transplant training for doctors. Every of our training courses and workshops can be scheduled by physicians and medical assistants (read also FUE Workshops). The Hair Transplant Training Center firmly believes that successful results can only be achieved in collaboration with the whole team of a clinic as everyone is contributing to the final result. Our hair transplant training will be supported by the Hairline Clinic in Ankara providing a hand-picked and professionally trained staff which is courteously attending every hair transplant procedure of the Hair Transplant Training Center. Visiting doctors are not subjected to bring medical assistants with them for attending our training courses. A series of necessary information and practical hand-on training given at the Hair Transplant Training Center will explore key areas of hair transplant methods including a comprehensive syllabus of topics. Participants will be encouraged to follow our training program covering all necessary aspects of modern hair transplant methods involving the practice and utilization of surgical tools for every process of a procedure. As older methods of hair transplant have regularly caused great embarrassment and emotional distress to patients with leaving a tell-tale linear scar on the back of their head behind research has been leading to a new and minimally-invasive method for hair transplant. Since hair grows in groupings of 1 to 4/5 each the isolating and single extraction of follicular units has become an exclusive technique to redistribute donor hair to the recipient site. Patients can easily sit back without feeling any pain while the hair surgeon is using his technical instruments and medical devices to safely harvest and place the grafts / follicular units. As no linear scar will be left behind at the head of the patient this method effectively reduces the final recovery time. A comprehensive understanding of this method is involved with the precision and accuracy needed to perform successful hair transplants. The Hair Transplant Training Center is focusing its training program on FUE as the latest state-of-the-art method for hair transplant involving a number of medical tools and instruments for each process of the procedure. During the extraction process both manual and automated FUE punches / extractors will be used on patients and presented to attending physicians and practitioners. Trainees are encouraged to make use of all medical instruments provided by the Hair Transplant Training Center. Among the range of our surgical tools one will also find the PCID, a new and revolutionary machine manufactured by Coleinstruments and personally being developed by Dr. John Peter Cole, MD (USA). It features a modern electric device to safely harvest follicular units with computerized help. Furthermore a large number of manual FUE extractors will be presented for diversified application on both donor and body hair. Patients with insufficient donor supply and advanced degrees of hair loss often helplessly face an unprecedented process of inherited balding. As FUE (Follicular Unit Extraction) allows to exclusively harvest follicular units (grafts) from every part of the human body even those patients with only little donor supply can opt for a hair transplant. Former strip surgery-patients often complain about the tell-tale scar at the wreath of the scalp to unnaturally appear in the public lately. Also these patients have the chance to camouflage and disguise their scar by the use of BHT (Body Hair Transplant) since this method often qualifies for hair transplant as much as regular donor hair transplantation. Eyebrow transplant and old plug repair feature further methods qualifying for BHT (Body Hair Transplant) as normal chest hair and beard hair can preferably be used for the hair transplant. Due to the fact that this method is highly demanding and often appears labor-intensive to physicians and hair surgeons it preferably asks for accuracy, excellency and artful skills as much as for experience. BHT is only provided by a selected number of hair surgeons worldwide. With Body Hair Transplant follicular units with one hair only can regularly be extracted by the use of accurate and precision surgical instruments from selected parts of the body. Single grafts being harvested from the body have a different structure, diameter and growth cycle than those of regular donor hair from the head. Famous hair surgeons regularly performing BHT with outstanding results are Dr. Özgür Oztan and Dr. John P. Cole. Read also “Hair Transplant Training – Schedule and Registration“.